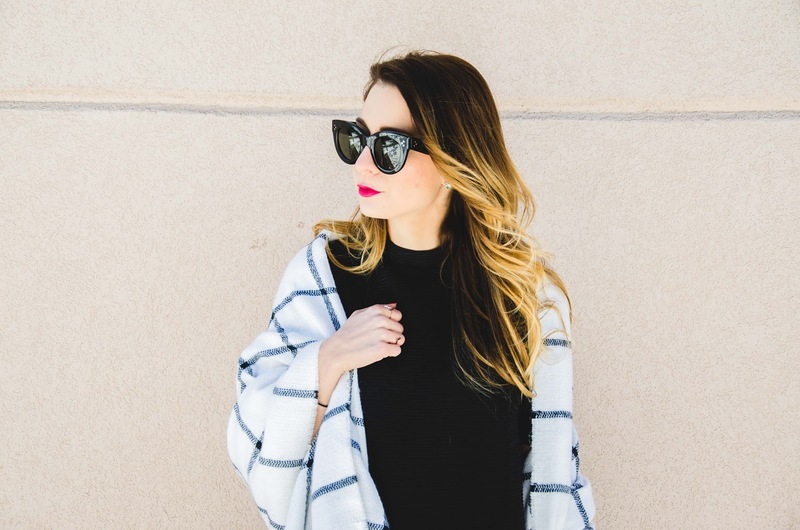 OOTD - Grid Scarf | La Petite Noob | A Toronto-Based Fashion and Lifestyle Blog. Happy Spring! I may be jumping the gun just a bit, but the temperatures have been so mild in Toronto and with no signs of cooling I think it's safe to say that Winter is done for another season. As much as I'm excited for warmer weather, I will miss a few things from winter; mainly the faux fur and blanket scarves. This grid scarf is a great addition to any winter wardrobe and because it's a lighter palette I may be able to wear it into Spring. Coupled with some over the knee boots and a black shift dress, this grid pattern is great for adding some interest to an otherwise plain outfit and I'm happy to have it included in my last winter outfit of the season! What do you guys think? Are you happy for the arrival of Spring? What will you miss from Winter? Let me know! So chic! Love the back on black paired with the lip! So good! I am soo ready for spring. Beautiful look! I like your sunglasses! actually dying over your sunglasses especially paired with that scarf! The scarves will have to stay around for awhile. Bring on Spring! !